"We Can't Re-Freeze the Greenland Ice Sheet"
Ok, I know this is not exactly breaking news -- but this news about our world's ever decreasing icy lands seems worth passing along if only because of this striking map of the entire globe and ice loss. Check it out! Here are the most interesting facts - in my opinion - from the article: the Arctic ice melt is incredibly dramatic - from 1979 through 1996, ice area decreased by around 3 percent per decade directly because of rising temps. The ice has decreased so much that ships are now journeying over the top of the world. 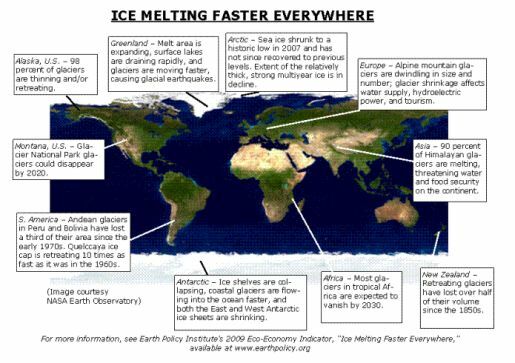 Also, not only is sea ice melting, but ice thickness and volume is disappearing -- meaning ice sheets can break up, melt and disappear even faster as temps climb. Not only is the loss of glaciers and ice sheets a shame because they are beautiful and powerful forces of nature, when we lose them we lose our steady supply of drinking water that literally billions of people count on with their lives.